It may be Father's Day this weekend in my home country of Australia nevertheless Mom's manage to steal the limelight for Vogue Italia's September 2013 "Like Mother, like Daughter" themed editorial. 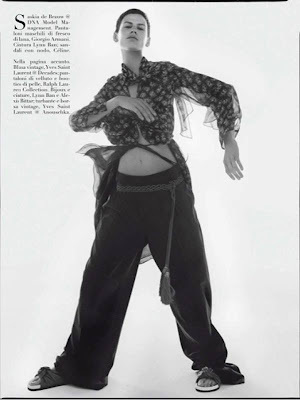 Top models Doutzen Kroes, Julia Nobis, Amanda Murphy, Stella Tenant, Saskia de Brauw, and Julia Stegner pose for Steven Meisel in dual incarnations as mother and daughter. Meisel's uncanny ability of taking an idea and imbuing elements of fashion and fantasy to create an editorial is in full effect as Kroes, Tennant et al. play high fashion dress ups. Fashion editor Marie Amélie Sauvé matches individual looks to each model with ensembles from the Fall/Winter 2013 collections of Saint Laurent, Loewe, Chanel, Hermes, and Gucci. The editorial has something in the bag for everyone running the full gamut from Tenant's sublime aristocratic air, Nobis' effortless cool girl vibes, de Brauw's free-spirited bohemian flair, and Murphy's modern day glamour. It is industry veteran Doutzen Kroes who trumps the competition by scoring the all important September issue cover slot and her fourth Vogue cover for the month, peering innocently with a doe-eyed expression while donning a retro-inspired outfit and beret.